Can You Guess the Tune? :o) ~ The Toronto Hare Krishna Temple! While it might be old news for savvy internet browsers, Google had a very unique "Google Doodle" on their homepage yesterday (and it has continued today). The Google Doodle is the often customized version of the "Google" logo that appears on the search engine's home page. 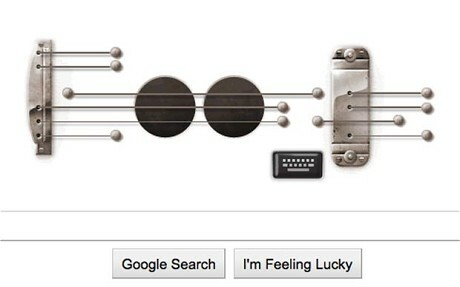 The doodle, in honor of musician and electric guitar pioneer Les Paul, featured the strings of a guitar in the shape of the Google logo. That logo, however, was actually playable—strum it with your mouse and it played a song. In the U.S., meanwhile, users could record a 30-second snippet of their creations and share with friends. wow "here comes the sun" did you do it?